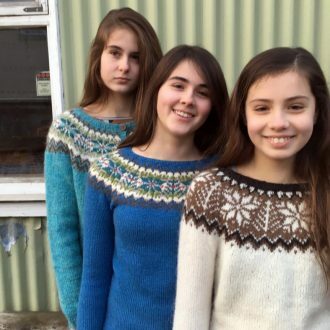 Hjaltlandspeysa, “a lopi sweater from Shetland”, is playing with those fine lines. 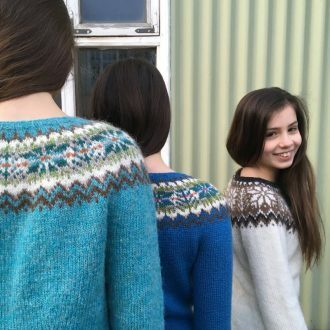 Simply by changing the color combination, it looks dramatically from Shetland or dramatically from Iceland. 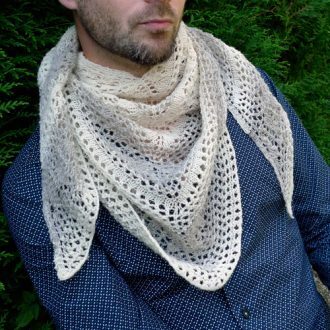 Truth is, it is a blend of both traditions to which I added my own personal flair. 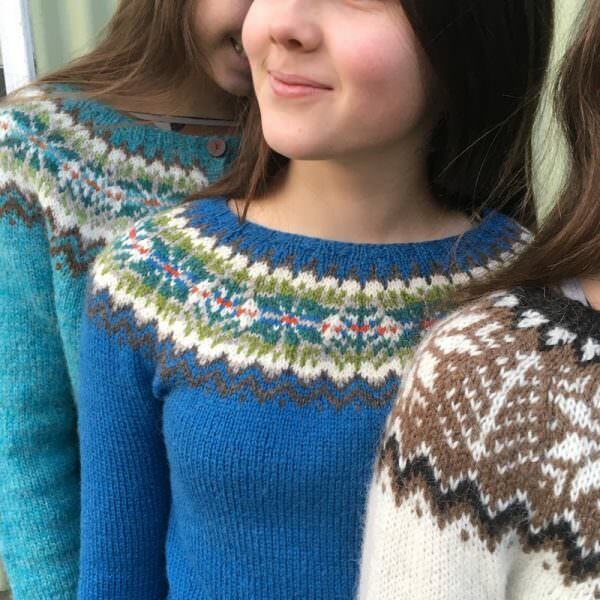 The typical “tree and star” yoke motif from Shetland is framed between geometric motifs that reached all the way to the collar as is popular in Icelandic lopi sweaters. 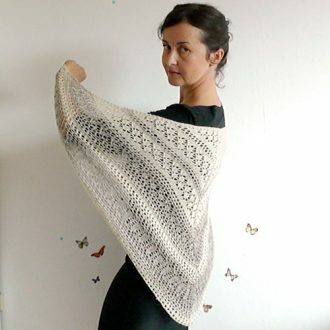 The Kit contains enough Léttlopi to knit a project in the color/size of your choice. If you want to change a color from those proposed, please indicate them in the notes at the checkout. 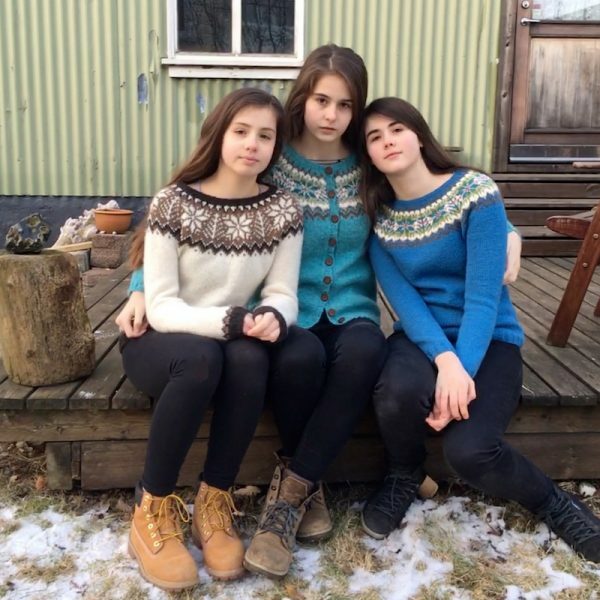 The circular yoke is a distinctive sweater style from the 20th century that can be found in many different countries, each with its specificity whereas it is in terms of construction and techniques, yarn used, motifs and colors. The frontiers between them can be a fine line and easily blurred. Hjaltlandspeysa, “a lopi sweater from Shetland”, is playing with those fine lines. 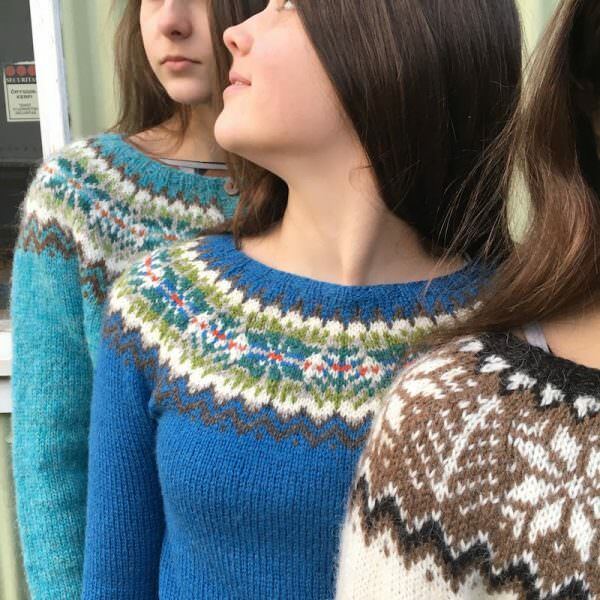 Simply by changing the color combination, it looks dramatically from Shetland or dramatically from Iceland. 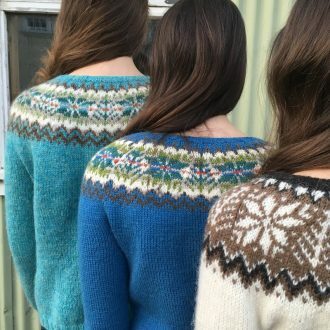 Truth is, it is a blend of both traditions to which I added my own personal flair. The typical “tree and star” yoke motif from Shetland is framed between geometric motifs that reached all the way to the collar as is popular in Icelandic lopi sweaters. 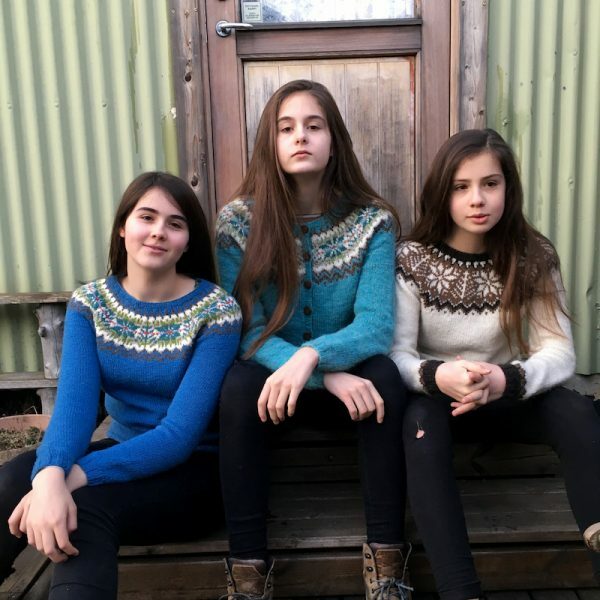 Motifs taken from the yoke are added at the bottom of the Lopi sweater style, as well as on the cuffs, a feature seen on the most traditional lopapeysur. In the colorwork, the Shetland rule “no more than two colors per row” is joyfully broken. The cardigan is steeked using the traditional Icelandic method for lopi sweaters. 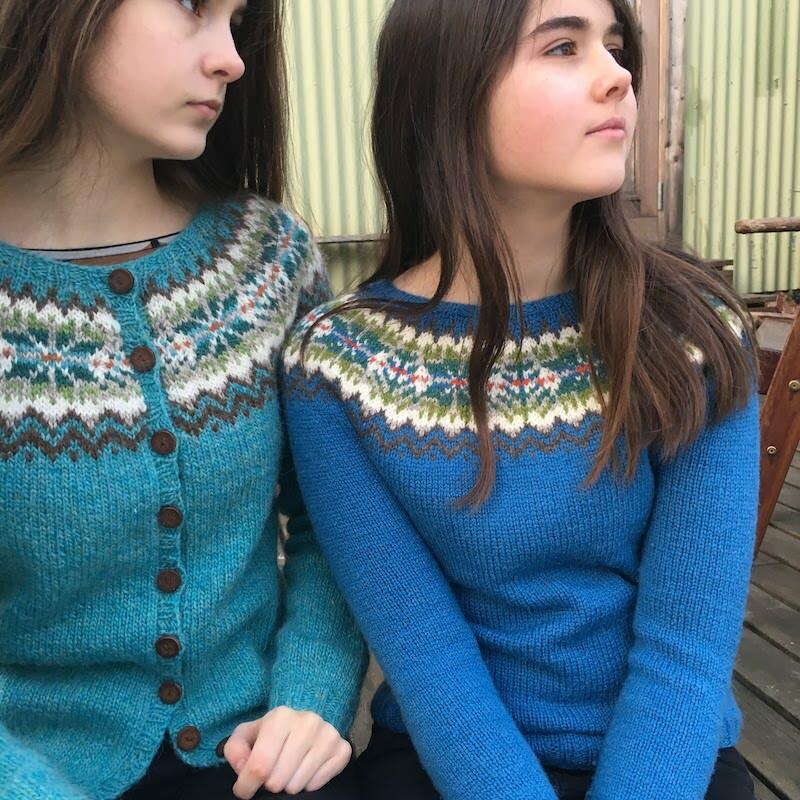 The blue Shetland style sweater is knitted with Scottish Buachaille yarn from Kate Davies but the turquoise cardigan version with the Icelandic unspun lopi, Léttlopi from Ístex. For the brown and white Lopi style sweater, I mixed together Léttlopi and a truly authentic Shetland yarn, the beautiful Foula yarn. 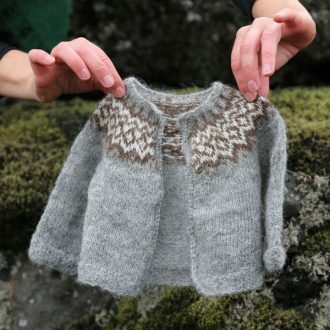 It is made with the wool from the Foula Island’s sheep, an indigenous population of native Shetland sheep that has maintain itself near unchanged due to isolation. Hjaltlandspeysa has my signature short rows to create a natural neckline and a clever shaping for a flattering fit. 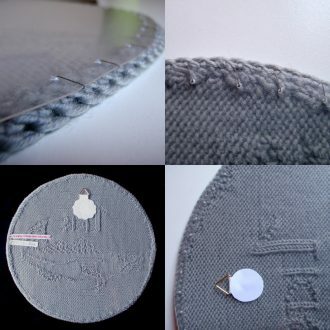 I’m also sharing a handy tip of mine to steek the sweater without having to use the sewing machine. Sweater or cardigan (steeked) with darted waist. 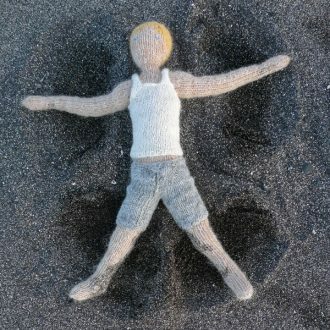 Positive ease: 5 cm/2” ease. Lopi style sweater is a size 3, blue Shetland style sweater a size 2 and turquoise Shetland style cardigan a size 3. 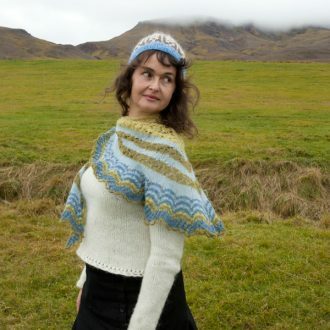 Note that the row gauge is slightly smaller with Buachaille: you will work more rows to achieve the lengths stated in the pattern. 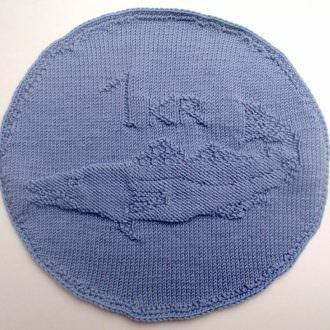 Needles: 4 mm/US 6 and 4.5 mm/US 7 circular needles. 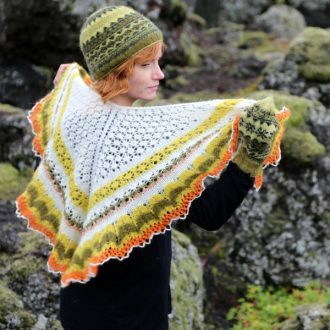 Magic loop is used for smaller diameters but you can use double-pointed needles. 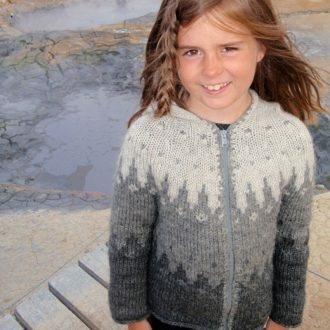 Other material: for the cardigan, 8 or 9 buttons and as an option ribbon twice the length of front opening to cover the steek. Techniques: The body and sleeves are knitted in the round in Stocking st. At the armholes, they are combined on one needle and the motif knitted in stranded knitting. The underarms are grafted. 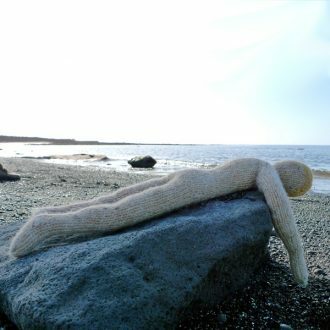 The cardigan is steeked. 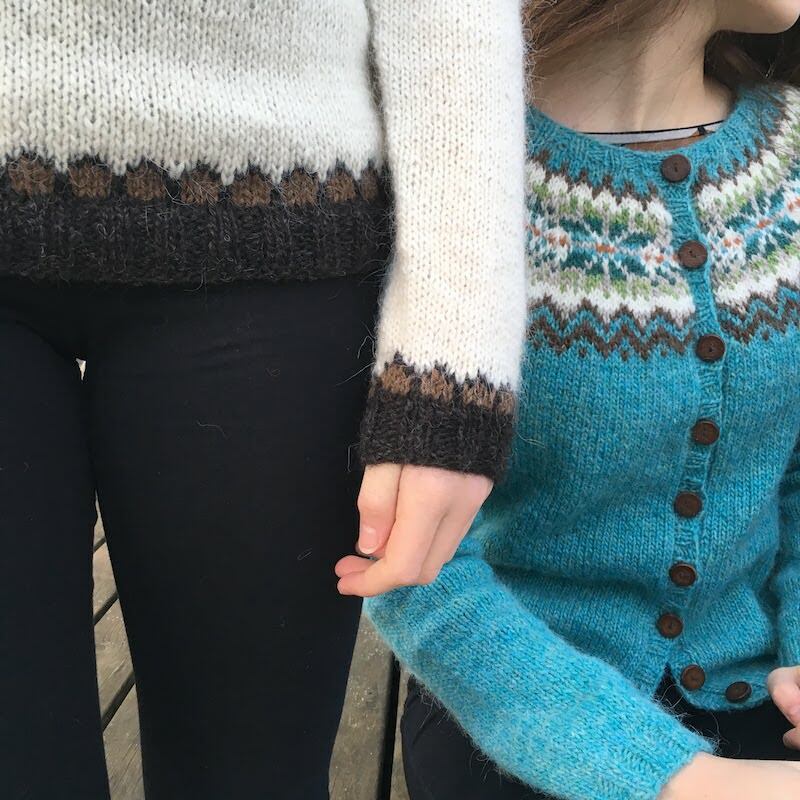 Hélènes’s signature short rows to create a natural neckline and a clever shaping for a flattering fit. Hélène is also sharing a handy tip to steek the sweater without having to use the sewing machine.